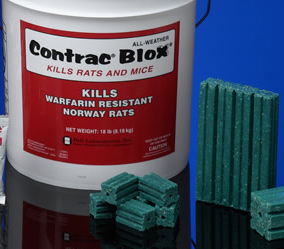 Contrac Blox are a single feeding, anticoagulant rodent bait from the pros at Contrac. Using Bromadiolone, a safer, less toxic anticoagulant, will kill rodents with the best of them. These rodenticide Blox have a hole drilled through them making them perfect for any rat stations that have posts. These blox can be used in ANY weather and are highly palatable for rodent acceptance! The bait of choice in the pest control industry, Bell's patented All-Weather BLOX are perfect for ANY use since they are made from Bell's unique extrusion process that yields a hard, multiple-edged bait with the palatability of a meal bait and the weatherability of a paraffinized bait offering you the BEST OF BOTH WORLDS! BLOX get unsurpassed rodent acceptance AND control! The multiple edges appeal to a rodent's desire to gnaw and BLOX are made with food-grade ingredients and small amounts of paraffin for a highly palatable bait. BLOX work well in any condition -- wet or dry, indoors or out. A hole in the center of the Contrac BLOX lets technicians place it on bait securing rods in bait stations, or nail or even wire it in place! Would you like to see the Contrac Blox Label? How About The Contrac Super Blox Label? How about the Contrac Blox/Super Blox MSDS sheet?